Penny Burgess, 54, has achieved her dream of cycling the 1,105 mile route from Land’s End to John O’Groats thanks to the support of a state of the art Electric Bike from A2B. Penny, who suffers from Crohn’s disease, had previously assumed her illness would prevent her from ever making the journey. However after the Ecotricity worker was lent the A2B German designed ‘Obree’ model from eCycle in Stroud, her ambitions have become reality. A2B’s eBikes work like any other traditional pedal bike, however the rider can switch to motor assist, taking the stress and strain out of any journey. Travelling up to 15mph on motor assist alone, the ‘Obree Model’ that served as Penny’s travel companion is named after record breaking Scottish cyclist, Graeme Obree. Global Marketing and Communications Manager at A2B, Sophie Brewitt, said: “We take our hats off to Penny for such courage and determination. We are thrilled we could help her achieve her dream. All donations made will go to Crohns and Colitus UK. 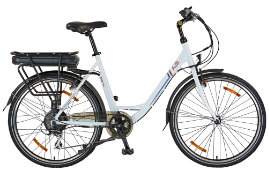 A2B is the German designed and engineered, award winning premium e-bike brand. Headquartered in London with subsidiaries in the UK, USA and Germany and present in more than 30 countries through its network of distributors in Europe, Asia, America and Africa. We are proud that our e-bikes have been recognised by prestigious organisations such as ExtraEnergy.com, the German-based worldwide LEV testing authority and the British Design Museum in London, which nominated the Obree for the international Designs of the Year Award in March 2014. A2B is part of the Hero Eco group.